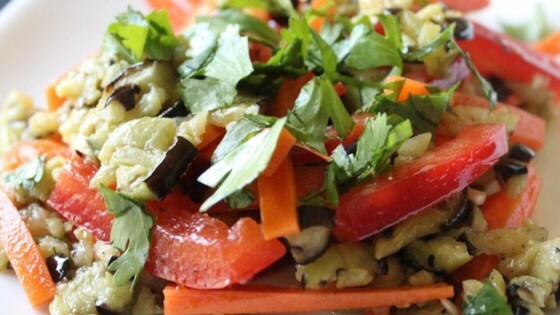 "Vegetarian eggplant salad has deep flavor and is delicious." Arrange eggplant slices in a baking dish; sprinkle with sea salt. Drizzle 1 tablespoon olive oil over eggplant. Bake in the preheated oven for 5 minutes; flip and continue baking until tender, about 10 more minutes. Remove eggplant from oven and cool; slice cross-wise into 1/8-inch thick slices. Whisk 2 tablespoons extra-virgin olive oil, lemon juice, garlic, black pepper, and sea salt together in a bowl until dressing is smooth. Toss baked eggplant, red bell pepper, and carrots together with lemon dressing until evenly coated. Sprinkle cilantro over salad. I was looking for an eggplant recipe that didn't contain gobs of cheese. This was very delicious! Thanks for sharing. If I could give this more stars I would! I was not expecting this to be SO GOOD!! I ate this with homemade sprouted tortilla chips. YUM!!! This is just awesome!!!! I have really never liked eggplant till this Thank-You!